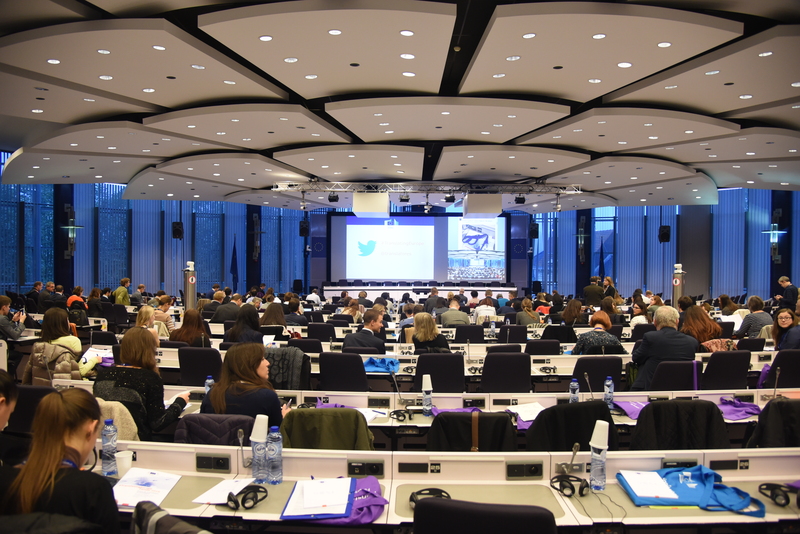 The 5th edition of the Translating Europe Forum on 'translation in the age of data' brought together around 500 professionals from the language industry, academia and the public sector in Brussels on 8-9 November 2018. Many more followed the event online via live web-stream. The keynote speech by Nozha Boujemaa on day one addressed the impact of artificial intelligence on society and the language industry. The keynote speech by Karim Benammar on day two highlighted the importance of personal perspective and the possibility of 'reframing translation'. The panel discussions looked into what kind of data is relevant, what 'clean data' means and how translators can benefit from the data they produce. Sharing translation data, legal aspects and latest developments in neural machine translation were discussed as well. A panel on the EU perspective gave an overview on what the EU is doing: the Connecting Europe Facility, the multilingual ‘digital single market’, education, growth and jobs, and the European Parliament report 'Language equality in the digital age'. In his speech, Commissioner Günther Oettinger underlined the importance of translation for the European project and looked ahead to the European elections in 2019. EMT students presented posters and demonstrated various machine translation systems during the breaks in the'Networking Village', which also featured information stands by EU Commission facilities. For the discussions on social media during the conference see: #2018TEF. How is artificial intelligence transforming society and the translation industry? AI can help shape business and generally make our lives easier? What innovative technologies, strategies and competencies are needed to make society benefit from AI? What about the pitfalls? What about ethics? How does AI affect translation and the future of the language industry? Is the translation industry different from other industries? The aim of this session is to paint the broader context for the rest of the Forum. This session will look at the latest developments in neural machine translation (NMT) and AI. How does NMT work and what kind of data is needed to create a fluent engine? How can these be obtained? What are the features of the current cutting-edge tools? What about integration of NMT in current CAT tools? What are the next steps? What new opportunities does this represent for people working in the language industry? John TINSLEY, Co-founder and CEO at Iconic Translation Machines, Ltd.
How do practitioners deal with translation data and how can they benefit from them? How can translators best manage their data? What data are available to translators? Corpora, translation memories…. Can freelance translators build or train their own MT engine? What training and skills are needed to work with data in translation and how does this change the traditional work of a translator? What skills for 'data curators' in the translation field? Tanguy FAUCHIER, internal linguist, Sanofi S.A. This session will look at data from the legal point of view. The aim is to raise awareness of aspects such as: data and IPR (does the new GDPR play a role; how to make your translation business GDPR-compliant? ), re-use of data, confidential data, MT in the cloud, data ethics (how is data generated, recorded, curated and shared). Throughout the year, local Translating Europe workshops are organised which yield a lot of insights in local markets, practices and opportunities. This session will showcase three workshops on data, technology and the skills to deal with them, and can serve as inspiration for further training of translators. What is happening at EU level? What does the EU do to remove language barriers through technology? The role of the Connecting Europe Facility in bringing down language barriers; link with the Digital Single Market, Growth and Jobs and Education. The European Parliament's perspective: the report on Language Equality in the Digital Age. Interactive session with the audience on Change Management, looking into how to deal with technology-driven change that may be disruptive. Reframing how translators see their profession and their future. Can small language service providers (LSPs) and freelancers leverage the data they produce or is this only possible for the big players in the market? What about confidentiality and data security issues? Where do you find data and how do you decide if they are usable? How can/should small language service providers adapt their business model? Sharing of translation data – pros and cons, possible pitfalls? How can data collected from industry surveys benefit translators? What questions are often asked about the translation industry? What are the questions that have not yet been asked? What does data tell us and how can the industry use the data? Discussion on the results of EMT-LIND pilot projects using state-of-the-art terminology management tools and a look at the opportunities offered by cloud-based platforms. What new trends are there in the way we teach and work with new tools?. Data and translation — a pretty picture? Informal discussion on the insights gathered from the previous sessions, kicked off by cartoons produced during the conference.